Background Despite concerns that non-steroidal anti-inflammatory drugs (NSAIDs) contribute to acute kidney injury (AKI), up to 75% of ultramarathon runners ingest these during competition. The effect of NSAID on AKI incidence in ultramarathon runners is unclear. Methods Multisite randomised double-blind placebo-controlled trial in the Gobi, Atacama, Ecuador and Sri Lankan deserts to determine whether ibuprofen (400 mg every 4 hours) would be non-inferior to placebo during a 50-mile (80 km) foot race. The primary outcome was incidence of AKI defined as severity categories of ‘risk’ of injury of 1.5× baseline creatinine (Cr) or ‘injury’ as 2× Cr, combined to calculate total incidence at the finish line. Non-inferiority margin for difference in AKI rates was defined as 15%. Results Eighty-nine participants (47% ibuprofen and 53% placebo) were enrolled with similar demographics between groups. The overall incidence of AKI was 44%. Intent-to-treat analysis found 22 (52%) ibuprofen versus 16 (34%) placebo users developed AKI (18% difference, 95% CI –4% to 41%; OR 2.1, 95% CI 0.9 to 5.1) with a number needed to harm of 5.5. Greater severity of AKI was seen with ibuprofen compared with placebo (risk=38% vs 26%; 95% CI –9% to 34%; injury=14% vs 9%; 95% CI –10% to 21%). Slower finishers were less likely to encounter AKI (OR 0.67, 95% CI 0.47 to 0.98) and greater weight loss (−1.3%) increased AKI (OR 1.24, 95% CI 1.00 to 1.63). Conclusion There were increased rates of AKI in those who took ibuprofen, and although not statistically inferior to placebo by a small margin, there was a number needed to harm of 5.5 people to cause 1 case of AKI. Consideration should therefore be taken before ingesting NSAID during endurance running as it could exacerbate renal injury. Acute kidney injury (AKI) is a common finding in endurance runners, encountered in 34%–85% of ultramarathoners. Non-steroidal anti-inflammatory drugs (NSAIDs) are thought to contribute to AKI, although 35%–75% of ultramarathoners ingest them during competition. Evidence from retrospective studies of NSAID and AKI offers conflicting results, and while the majority show no ill effect, a randomised controlled trial has not fully explored this causative relationship. This double-blind randomised placebo-controlled trial showed increased rates of AKI in those who took ibuprofen, and although not statistically inferior to placebo by a small margin, there was a number needed to harm of 5.5 people to cause 1 case of AKI. Consideration should be taken before ingesting NSAID during endurance running as it could exacerbate renal injury. AKI was associated with faster finishers and greater weight loss, suggesting that dehydration may play a role. Previous investigations into the role of NSAID as a causative factor for renal injury in endurance runners reveal mixed conclusions. One study found higher serum creatinine (Cr) levels in runners who ingested NSAID,8 while the majority of studies showed no significant association.3 4 10 12 The only prospective trial to date that examined this relationship found no renal dysfunction in the NSAID group of runners, but due to methodological constraints its conclusions were limited.12 To determine the effect of NSAID on AKI, we compared renal function among ultramarathon runners who were randomised to either ibuprofen or placebo during the course of a 50-mile (80 km) foot race. We hypothesised that ibuprofen would not result in a significantly increased rate of AKI compared with placebo. We conducted a multisite, randomised, placebo-controlled, double-blind non-inferiority trial during the 50-mile (80 km) fifth stage of the RacingThePlanet 7-day, six-stage 155 mile (250 km) ultramarathons. Eligible participants were between 18 and 75 years of age who were enrolled at the 2015 Atacama Desert, Chile, Gobi Desert, China, Ecuadorian, and 2016 Sri Lankan ultramarathons. These events are run through wilderness terrain with few roads and varying topography. Participants carry all their personal items for the duration of the race, including gear, food (minimum of 2000 calories/day) and clothing. All participants are offered the same amount of water each day (1.5 L per 10–12 km along the course of the stage), with a given allotment of time to complete each stage. These events comprised six stages run over 7 days, with four consecutive single-day stages of 25 miles (40 km), with a 2-day fifth stage of 50 miles (80 km), and a final single-day 5–6-mile (10 km) stage. Eligible participants had to understand English and be registered to run a RacingThePlanet event. Exclusion criteria included ingestion of NSAID or corticosteroids 12 hours prior to stage 5 start, allergy to NSAID, pregnancy or suspected pregnancy and having one kidney or other known medical problem contraindicating NSAID use. The study was approved by Stanford University School of Medicine institutional review board. Protocol training was by study manual on procedures for blood collection and point-of-care analysis. Participants were assigned in a 1:1 ratio using computer-generated block randomisation. Medications were prepared by Advantage Pharmaceuticals (Rocklin, California, USA), and then packaged and randomised using a computer-generated random sequence by the investigational pharmacy at Stanford University Hospital. Randomisation and drug allocation occurred just prior to the start of the fifth stage. Study participants were randomised to either ibuprofen (400 mg) or visually identical placebo taken every 4 hours after the start of the fifth stage for the duration of the stage. As approximately 80% of runner historically complete a RacingThePlanet 50-mile stage in <19 hours, the upper quartile of ingested ibuprofen was estimated to be 1600 mg.
We gathered informed consent and baseline demographics the day prior to the race start at race registration, with randomisation prior to the start of the fifth stage. Participants were weighed just before the start of the 50-mile (80 km) stage 5 with no pre-race phlebotomy. Each participant was weighed in running gear and shoes without a backpack, using a calibrated battery-operated digital scale (SC-505 HoMedics; Commerce Tsp, Michigan, USA) placed on a level surface. At the finish line of stage 5, or on removal from competition, weights were measured by the same procedure and fingertip blood samples obtained via lancet and capillary collection tube, then analysed immediately after collection using an iSTAT point-of-care analyser (Abbott; East Windsor, New Jersey, USA). Evaluation of the study participant was performed immediately on completion of stage 5 before post-ace hydration could occur. We assessed protocol adherence by inspecting the plastic bag for remaining pills. If the participant had lost the bag, we assessed protocol compliance by interview. Both the point-of-care device and the digital scale were calibrated prior to taking measurements. A baseline expected glomerular filtration rate (GFR) of 100 mL/min was used when age was <40 years, and 140 minus age when 40 years or older.15 This estimated GFR was then used in the ‘modification of diet in renal disease’ equation to back-calculate an estimated baseline Cr,16 with a numerator of 175 used for improved accuracy of the equation in a healthy population.17 All participants who took supplemental NSAID or less than three study pills were considered to be non-compliant with the study protocol. For the intent-to-treat (ITT) analysis, all randomised participants except those who did not have a Cr measurement for primary study outcome were analysed in the group they were originally randomised to, regardless of compliance. Secondary outcome measures were detailed prior to trial initiation and included incidence of exercise-associated hyponatremia (EAH) and Borg score survey for rating of perceived exertion at the fifth stage finish line as well as severity of AKI and change in Cr. The serum sodium cut-off points were the following: hypernatremia>145 mmol/L, normonatremia 135 –<145 mmol/L, hyponatremia 130 –<135 mmol/L and severe hyponatremia<130 mmol/L. Weight change cut-off points were overhydration with a weight gain of >+0.0 kg, euhydration = weight change between −0.01% and −3.0%, and dehydration = weight change >−3%. The study was designed as a non-inferiority trial, conducted with the primary outcome of AKI incidence and the null hypothesis that ibuprofen was worse than placebo regarding its detrimental effect on renal function during an ultramarathon. Before the study, an ad hoc verbal survey of ultramarathon runners during RacingThePlanet Iceland 2013 was conducted. The consensus was that a difference of <15% AKI incidence would be an acceptable margin to accept potential renal injury for perceived analgesic benefits, and a greater incidence of AKI would discourage NSAID use. So assuming a clinically significant increase of AKI of 15% as the non-inferiority threshold, with incidence of AKI of 60% and β=20% and α (one-sided)=0.05, we estimated that enrolment of 115 total participants would allow us to reject the null hypothesis and conclude ibuprofen was not inferior to placebo and appropriate analgesia to ingest during an ultramarathon. Outcomes were analysed in the ITT population in order to evaluate real-world race conditions. Additionally, we analysed per-protocol results for non-inferiority for both the primary and secondary outcomes to assess the effect of a complete treatment course. ITT analyses of univariate comparisons were performed with Pearson’s χ2 and Fisher’s exact tests for categorical variables, independent-sample t-tests for continuous variables and Wilcoxon rank-sum test for non-normally distributed variables. Logistic regression was used to examine multivariate risk factors that had significance of ∝<0.10 for ORs. Pearson’s correlation test was used to assess linear correlation between drug use (ibuprofen or placebo) and Cr changes from estimated to measured values to provide further insight into the different relationship in the two drugs. A one-sided Welch two-sample t-test was used to identify significant differences in measured Cr between treatment arms. p Values<0.05 were considered significant and 95% CIs used. All analyses were conducted using computerised software (R 3.1.0 software; Vienna, Austria). Of 159 enrolled participants, 91 (57%) were randomised to either ibuprofen or placebo and received the medications, with 89 participants (47% ibuprofen and 53% placebo) analysed for the study primary endpoint and who qualified for the ITT population (figure 1). The most common reasons for study exclusion included 43% who did not pick up the study medications, 25% ingested NSAID<12 hours prior to the start of stage 5 and another 16% who withdrew from the event prior to stage 5. Two participants were excluded due to equipment malfunction as study end-of-stage Cr levels could not be analysed. Baseline demographics of the ITT population are described in table 1, with characteristics that were not significantly different between treatment arms (p>0.1). 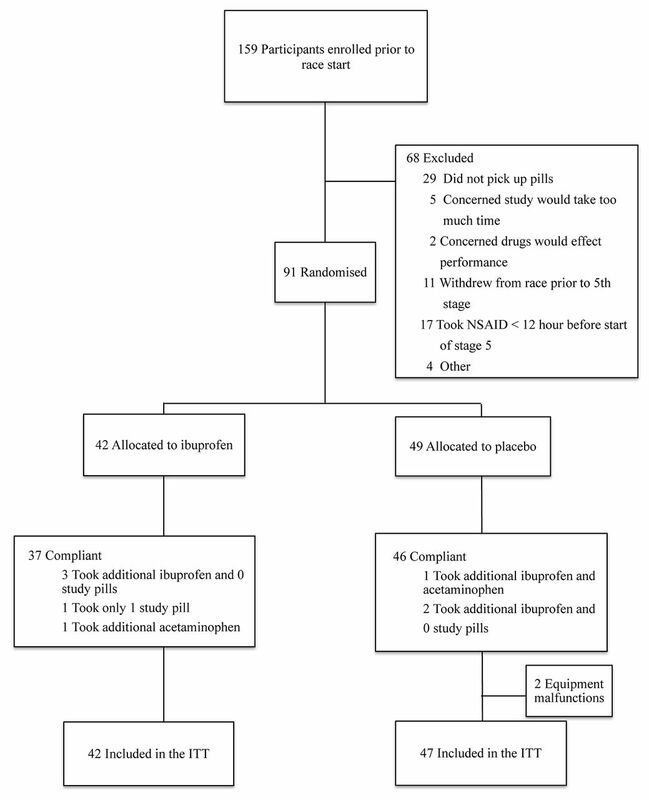 The average amount of ibuprofen ingested was 1200 mg, with 75% of participants taking between 1200 and 1800 mg.
Consolidated Standards of Reporting Trials flow diagram. NSAID, non-steroidal anti-inflammatory drug. The overall incidence of AKI was 44%. For the primary outcome in ITT analysis, ibuprofen increased the incidence of AKI by 18% (95% CI −4% to 41%), with a number needed to harm of 5.5. There was a statistically significant correlation between ibuprofen use and Cr change (r2=0.2, p<0.01) compared with placebo (r2=0.05, p=0.14) (figure 2). Correlation between changes in creatinine (Cr) per treatment group. In the secondary outcomes, there was a non-statistically significant greater severity of AKI in the ibuprofen group, with 13% more meeting risk criteria (95% CI −9% to 34%) and 6% more meeting injury criteria (95% CI −10% to 21%) (table 2). Although AKI was different between the groups, there was not a significant difference in post-race Cr between the two groups (p=0.25, 95% CI −0.13 to ∞). There were no statistically significant differences between intervention groups and incidence of EAH and Borg scale, although decreased sodium (increased EAH) was found in the NSAID group by 8% (table 2). Incidence and severity differences per treatment groups were similar in the per-protocol population (data not shown). Slower finishers by quintile were less likely to encounter AKI (OR 0.67, 95% CI 0.47 to 0.98), and each quintile of slower finishing performance reduced the odds of AKI by 0.37. Greater weight loss was significantly associated with AKI, in both absolute loss (1 kg, p<0.02) and percentage change (1.3%, p<0.002, OR 1.2, 95% CI 1.00 to 1.63), where each 1% of weight loss increased the odds of AKI by 0.21. There were no significant effects on the primary outcome of AKI incidence between treatment groups and the prespecified co-variates of the study participants with logistic regression (table 3). This was the first double-blind randomised placebo-controlled trial to date that examined the causative effect of ibuprofen on AKI in ultramarathon runners. We found that runners who ingested an average of 1200 mg ibuprofen over the course of a 50-mile (80 km) foot race had a greater absolute rate of AKI compared with placebo. The severity of AKI was also worse in the ibuprofen group than the placebo group. Ibuprofen did not definitively demonstrate inferiority to placebo although it increased AKI by 18%, crossing the prespecified non-inferiority threshold of 15%. This approached, but did not reach, statistical significance by a small margin. Our study did not reach the enrollment threshold powered to establish non-inferiority and had a high rate of attrition, which may have led to a type II error. However, as the upper 95% confidence limit for the primary outcome was 41% that far exceeded the non-inferiority margin, it is unlikely that the null hypothesis would be rejected and non-inferiority established with a larger cohort. As this trial was 40% larger than the only other prospective study on this subject,12 larger investigations into renal function and NSAID use of endurance runners may be logistically unfeasible. We chose to power our study to a threshold effect size of 15 percentage points as that would alter the behaviour of the athletes who routinely take this medication and encounter AKI. Healthy population-based studies have found the risk of symptomatic acute renal disease caused by NSAID to be 1:100 000, spontaneously occurring in approximately 1%–5% of NSAID users that may translate to upwards of 2.5 million adverse events annually.19 20 Extrapolating the potential for symptomatic renal injury from NSAID use in the general population to high-risk endurance runners, we feel the risks outweigh the benefits of NSAID use and alternative options for analgesia such as acetaminophen should be considered. NSAIDs inhibit cyclooxygenase, which prevents the breakdown of arachidonic acid to prostaglandins that contribute to renal vasodilation. Without these prostaglandins, there is reduced renal perfusion leading to impaired GFR. The injurious effects of renal hypoperfusion in endurance athletes may be exacerbated by rhabdomyolysis and resultant myoglobinaemia, a common occurrence in ultramarathoners whose average creatine kinase can range from 13 000 U/L to >40 000 UL.10 21 Our study attempted to evaluate the clinical impact of NSAID by Borg scale, which is a validated scale of perceived exertion to quantify the physiological impact of exercise.22 23 As athletes ingest NSAID while exercising to minimise pain and optimise performance, it was hypothesised that the ingested drug could decrease perceived exertion secondary to decreased impact of pain. While there was no difference in the cohorts and perceived exertion by the Borg scale, figure 3 shows a non-significant increased Borg score in those with AKI which may reflect subtle effects from AKI on perceived exertion. Borg score of perceived exertion and acute kidney injury (AKI). Greater weight loss and finishing performance were both found to be independent risk factors for the development of AKI. The correlation between weight loss as a proxy for dehydration and kidney injury has been shown in prior ultramarathon studies,3–5 which supports the deleterious effects of underhydration on renal perfusion. The slowest ultramarathon finishers have been found to be to 82% less likely than top finishers to encounter AKI, and slower finishing times may allow for greater hydration and minimise dehydration-induced kidney insult.3 As we were unable to quantify the amount of fluid ingested, the pathophysiology of dehydration and AKI could not be explored in this study. There has been concern about the causative role of NSAID in EAH, although reports are conflicted and of questionable clinical significance.24 EAH is recognised as a relatively common issue in endurance running events. While EAH is usually an asymptomatic biochemical diagnosis that most often manifests as non-specific symptoms, it is a potentially fatal disease. NSAIDs act as an antidiuretic during exercise through inhibition of prostaglandins, sodium excretion and free water clearance that may contribute to a dilutional hyponatremia. Similar to our findings, the one other prospective trial that examined NSAID use and EAH showed no effect on post-race sodium levels compared with placebo.12 Future prospective studies may help elucidate the effect of NSAID on EAH. Hydration in endurance events should be dictated by a ‘drink to thirst’ strategy, and the theoretical benefits of avoiding dehydration to minimise AKI should not be confused with overhydration, which should be avoided and is a risk factor for EAH morbidity and mortality. This double-blind randomised placebo-controlled trial showed increased rates of AKI in those who took ibuprofen, and although not statistically inferior to placebo by a small margin, there was a number needed to harm of 5.5 people to cause one case of AKI. Consideration should therefore be taken before ingesting NSAID during endurance running as it could exacerbate renal injury. The authors acknowledge the generous support of RacingThePlanet staff and competitors, whose participation and enthusiasm made this study feasible. This work was presented at the American College of Emergency Physicians Scientific Assembly, October 2016, Las Vegas, Nevada, USA. 2016 state of the Sport - U.S. Road Race Trends. secondary 2016 state of the Sport - U.S. Road Race Trends. 2016 http://www.runningusa.org/state-of-sport-us-trends-2015?returnTo=annual-reports.
. Incidence and prevalence of acute kidney Injury during Multistage Ultramarathons. Clinical journal of sport medicine: official journal of the Canadian Academy of Sport Medicine 2015. National Kidney Foundation. K/DOQI clinical practice guidelines for chronic kidney disease: evaluation, classification, and stratification. Am J Kidney Dis 2002;39(2 Suppl 1):S1–266. Contributors GSL had full access to all the data in the study and takes full responsibility for the integrity of the data and the accuracy of the data analysis. GSL and CP were responsible for data management, analysis and interpretation of the data, and statistical analysis. Study concept and design: GSL, BJK, KS. Acquisition, analysis or interpretation of data, and drafting of the manuscript: all authors. Obtained funding: GSL. Study supervision: GSL, KS. Ethics approval Stanford University School of Medicine. Data sharing statement There is no additional unpublished data from this study that has been made available.